Learn Italian provides a full course of tutorials, games and tests to help children and adults to learn and practice their Italian online and become profficient speakers at a simple level. All the Italian has been carefully tailored to the UK Italian curriculum for Italian as a second language. 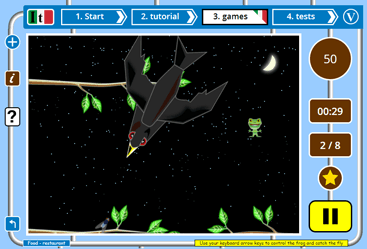 The frog flies - learn Italian free with the frog! Learn Italian provides all its lessons, games and tests completely free. There is no registration required, no hidden charges and no time limits when using this website. The resource can be used both on desktop computers and on tablets including iPads. Learn Italian is a free online Italian learning resource created and published by ic language in South Wales. ic language publish free learning sites for French, German, English EFL ESL, Spanish, Italian and Welsh. All of these sites use the language materials (pictures, texts and audio speech recordings) originally created for Teach Online, our online language teaching resources. The learning games, lessons and tests for Learn Italian have been developed for the use of individual language learners studying at home and are suitable for those starting to learn the Italian language.